Home > Heavy Duty V Belts > Power Ace 5V-8V Section Industrial V-Belts > 5V950 Narrow 5V Section V-Belt. > B92 Classcial V Belt. Heavy Duty V-Belt. B92 V Belt: B Section. Heavy Duty V-Belt. 95" (2413mm) L x 21/32" (17mm) W x 13/32" (10mm) D. Composite, multi-purpose construction. 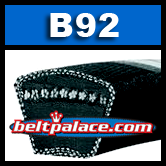 These B92 V-belts resist oil and heat, ozone, sunlight, weather, and aging. For all industrial applications, including v-flat drives. (AKA: B92 HI-POWER II V-BELT). Meets RMA oil and heat resistant standards and static conductivity requirements. B92KC V-Belt for Ag, Farm, and Lawn & Garden Equipment use. 92" Length, 21/32" Wide. Kevlar Covered HD B92 Belt.